Delta Nahanni Construction (DNC) Ltd. won the $3.7 million contract for Care and Maintenance activities at Tundra Mine. Delta Nahanni Construction (DNC) Ltd. won the $3.7 million contract for Care and Maintenance activities at Tundra Mine in April 2015. Tundra Mine is a former gold mine, located 240 km northeast of Yellowknife, NT near the north end of MacKay Lake. Operations at Tundra began in 1964. In 1999, the mine reverted back to the Crown when the mine’s owner at the time, Royal Oak Mines Inc., went into receivership. The mine site consists of a head frame, six raises, a mill, mine and camp buildings, fuel tanks, and a tailings pond surround by five dams. 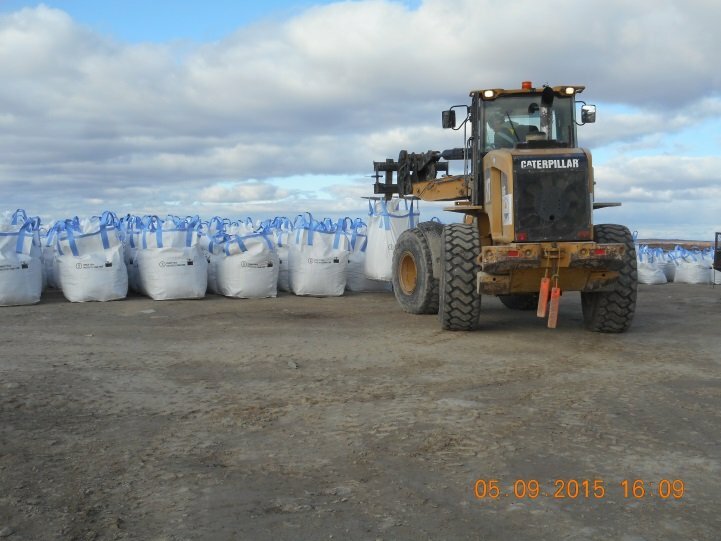 During the operation of Tundra and nearby Salmita Mines, processed tailings were deposited in Russell Lake (tailings pond). The water in the tailings pond has elevated levels of aluminum, arsenic, chromium, manganese, copper, iron, and lead. Due to an extended period of disuse, the structures on site have not been used since the mid-1980s and are generally considered unsafe. Tundra Mine’s remote location creates challenges for procurement and logistics as most supplies are required to be mobilized to site via winter road. The site is home to a variety of free roaming wildlife, including bears. Since 1999, the site has been in care and maintenance mode. Since being brought on site, DNC’s work activities have included dam repairs, hydrocarbon clean up, preventative maintenance, water treatment, and winter road support. DNC’s team of experienced professional engineers continues to provide guidance while additional research is being conducted to develop remediation strategies for the site. During the operation of the nearby Salmita Mine, ore was trucked from the mine along a 10 km road to be processed at the Tundra Mill. Salmita Mine ceased operations and was remediated by Royal Oak in the 1980s. Between 1964 and 1968, Tundra Mine produced over 100,000 troy ounces (3,250 kg) of gold from over 180,000 tons of ore.